Like the end of a horror film, just as you thought that your wallet could slump down against the wall, fire axe in hand, and have a moment to breathe, the withered, fiscally-cheap hand of the Steam Summer Sale has thrust out of the ground and risen again, to take your money and make your Steam account larger than the time you have to play it. 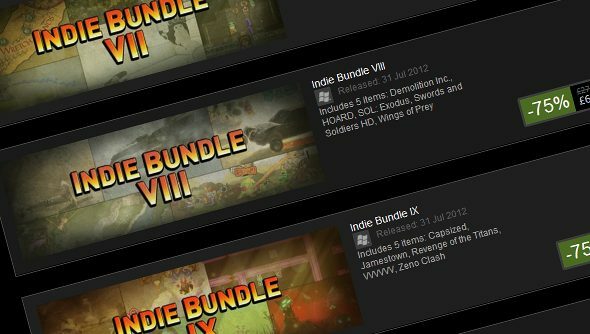 And so, every single Indie Bundle from this year’s Steam Summer Sale is back, at once, for you to buy. That means you can get the likes of Dungeons of Dredmor, Capsized, Spacechem, Audiosurf, Tiny Bang Story, Super Brothers, Atom Zombie Smasher, and World of Goo, if you haven’t already, in various different bundle forms. I often look at these as a good way to play games you wouldn’t otherwise. If you go in wanting just one game, you’ll suddenly end up with five, and you may as well play some in between the big releases this year. You might find something you love. Anyway, they’re all £6.99 and they’re pretty much all worth that much money. If you’ve got any money left, that is.